The Canadian government plans to kill wolves once again to try to save woodland caribou. An earlier murder escapade in Alberta didn't work (please see "Killing 890 Wolves to Learn About Them: Something's Wrong") and there's no reason to assume this one will. 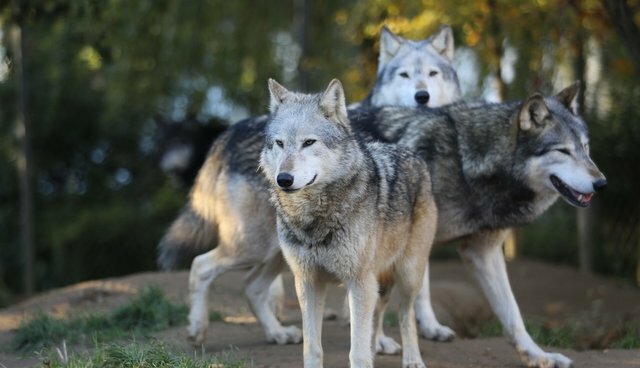 Shooters even use previously collared "Judas" wolves to lead the killers to more wolves. Details about this murder escapade can be found in an essay called "Stop the Brutal Slaughter of Wolves in Alberta and B.C." by Chris Genovali, Executive Director of the Raincoast Conservation Foundation. "This unscientific and unethical wolf cull is a consequence of oil and gas development, and industrial logging, which have endangered woodland caribou. The Alberta government and resource industries have transformed the caribou's boreal habitat into a landscape that can no longer provide the food, cover, and security these animals need to survive. Rather than address the real problem, i.e. the destruction of life sustaining caribou habitat, Alberta has chosen to scapegoat wolves, many of which are now using an extensive, industry-generated network of new roads and corridors to reach dwindling numbers of caribou." Raincoast senior scientist Paul Paquet notes, "Governments and the industries most accountable for the demise of Canada's natural environment have perversely and consistently diverted responsibility and accountability to others, including grey wolves." Of course, there are also supporters of this premeditated slaughter including John Bergenske of Kootenay-based conservation group Wildsight (see also). And, "the Peace Rod and Gun Club and others have announced a contest with prizes that include $1,000 for the largest wolf killed and $150 for the smallest, with a maximum of three dead wolves per contestant." However, Ian McAllister of Pacific Wild, says the hunt is illegal. When people ask me how this murder can happen and be casually and heartlessly defended as if it clearly okay to wantonly kill wolves, I simply say, as I have before, that some people simply like to kill other animals for fun and will defend their murderous ways however it suits them. I find this slaughter "in the name of conservation" or "in the name of anything" to be indefensible scientifically and also ethically. It really is morally repugnant, and I hope people will respond to the petitions to stop this murder. Cruelty can't stand the spotlight. For a video of how Budweiser misrepresents wolves please click here.